Common Pricing Question: If I discount, can I make it up in volume? A lot of promotions, rebates, coupons, and other discounts offer the promise of “making it up in volume.” But how reliable is this promise? In many markets, particularly those with high price elasticity (no, not every market has high elasticity), well-run discount campaigns can drive enough volume to make up for lower unit prices. One of the most profitable “make it up in volume” discounts was Microsoft’s decision to bundle a word processor, spreadsheet, and presentation software into one bundle, priced at about the same level as the individual programs. With low variable costs, the additional volume did not dramatically increase overhead. Competitors with only one offering, like WordPerfect for word processing and Lotus 1-2-3 for spreadsheets, found themselves priced out of the market. Many other discounts do not lead to such results. They diminish profits and attract price buyers who sop up valuable resources without substantial bottom-line contributions. They also train the market to wait for discounts. This often leads to more panicked discounting, continuing a downward trend. Here’s a graphical view of the problem that we like to show during “make it up in volume” discussions. Many companies would be lucky to have 30% margins. If your margins are lower, the incremental volume you need is even higher. This is not to say that you should always increase prices and never lower them. Certainly there are times when discounts and price drops are appropriate (just ask Bill Gates). 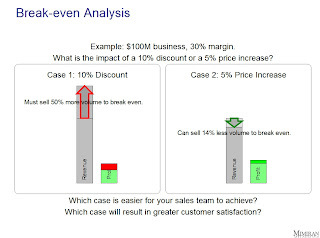 What we want to avoid is reflexive discounting without a good understanding of the business case. For example, do we even have the product available to meet the break even level? Also, lowering prices and increasing volumes may actually increase unit costs if you have to spend extra money on production, distribution, and service. The cost to manage this can be substantial. What if instead you invested the money in adding value to your product, customer experience, or sales message so that you could command a higher price? I love the concept, but am struggling with the math. Any chance you could get into the calculations on that example? Good question. I’ll post the actual slides in the next couple of days, which will explain the math and give you a chance to enter your own numbers.